The year is 1806, England is beleaguered by the long war with Napoleon, and centuries have passed since practical magicians faded into the nation's past. But scholars of this glorious history discover that one remains, the reclusive Mr Norrell, whose displays of magic send a thrill through the country. Proceeding to London, he raises a beautiful woman from the dead and summons an army of ghostly ships to terrify the French. Yet the cautious, fussy Norrell is challenged by the emergence of another magician: the brilliant novice Jonathan Strange. Young, handsome and daring, Strange is the very antithesis of Norrel. So begins a dangerous battle between these two great men which overwhelms that between England and France. And their own obsessions and secret dabblings with the dark arts are going to cause more trouble than they can imagine. Gorgeous. Enthralling. Captivating. Mesmerising. These are all words I certainly didn’t use when I first attempted to read Jonathan Strange & Mr Norrell a couple of years ago, finally abandoning it in disgust around the 600-page mark. I remembered little about the book, except that I quite enjoyed it at first but found that it soon became dry and laborious. However, I recently came to realise that I might be the only person in existence who has a problem with the book, and so resigned myself to give it another go . . . and WOW am I glad I did. Jonathan Strange & Mr Norrell is, ostensibly, a tale of two magicians named Jonathan Strange and Mr Norrell. But this is far too simplistic a description for what is actually a lengthy, beautiful, meandering tale of magic and ambition and rivalry and friendship, told over the span of a decade and often focusing on subplots and minor characters as much as on its two main protagonists. In Clarke’s alternative nineteenth-century England, magic is considered a lost art. Not since the disappearance of the Raven King – a legendary magician who once ruled the North – and his successors have there been any true magicians. That is, until Mr Norrell makes himself known as the only practical magician in England, and possibly the world. The fashionable people of London are delighted by such a novelty, while the government see in him an opportunity to gain advantage in the war against Napoleon. When a second magician presents himself to Mr Norrell as a pupil it seems everything is going splendidly . . . until their relationship becomes strained by professional disagreements, a series of tragedies, and the interference of a mysterious gentlemanly antagonist; and both Strange and Norrell begin to think twice about their ambition to restore magic to England. Clarke’s story, and the alternative England in which it takes place, is incredibly detailed and ambitious, astonishingly so when considering that this is the work of a debut author. Although the plot itself is anything but focused, this is clearly an intentional quirk that only adds to the novel’s charm, and the sense of unexpectedness created by the winding series of events is just one of the things that kept me reading. Though meandering, the story is nonetheless coherent and engaging. Each chapter is titled with the month and year in which it takes place, which is particularly helpful in keeping track of events; and an abundance of footnotes alternately provides the reader with additional information, historical references and fascinating anecdotes, adding further charm and depth to an already rich and satisfying reading experience. Furthermore, the pages are filled with beautifully vivid and evocative descriptions: of magical forests and city streets in winter, of candlelit libraries and dark landscapes, of ruined castles and mysterious roads. The author doesn’t just set the scene; she dazzles the reader with striking imagery and envelops them in an atmosphere both hauntingly magical and poignantly melancholy. Clarke bravely, and successfully, attempts to emulate nineteenth-century novelists in both subject and tone, and the result is a delightful hybrid of Austen’s droll social satire and ironic commentary, and Dickens’s comical caricatures and perceptive observations of city life. However, the dry humour suffusing the whole is, I suspect, entirely the author’s own, and it is this mocking, almost self-deprecating voice that provides entertainment at times when arguably nothing is happening plot-wise. I particularly enjoyed the satirical portrait of Mr Norrell that continues throughout the novel: Norrell is somewhat despicable what with his jealous hoarding of knowledge, rudeness to others and egotistical sense of his own superiority, not to mention his hypocrisy; and yet he is also clever and fascinating, and I found myself turning page after page just to see what he would do next. 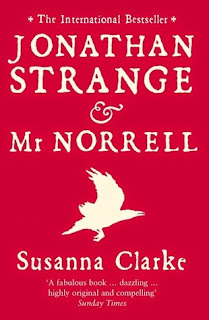 Of course both protagonists are entertaining in their own way, but Jonathan Strange & Mr Norrell is further brought to life by their friends and acquaintances, a brilliantly varied cast of secondary characters: Drawlight is despicable yet strangely sympathetic; Lascelles is clever and manipulative; Stephen Black is noble yet naïve; Childermass is wry and enigmatic; and naturally none are quite as secondary as they first appear, least of all the spectacular villain known only as the gentleman with the thistle-down hair. It might even be one of the best books I’ve ever read. It is almost certainly on my top ten or fifteen. Great book all around. And the TV version ain't bad either! I made a post a while back about my top fantasies, out of the over 250 I've read to date so far. Only came up with 7 names, but this was one, so I feel your feels :D You pretty much say it all about why this is one of the best fantasy novels out there! Her short story collection is great too, by the way. Most of the stories tie into JS&MN. You should check it out. I think I remember reading that post of yours - it's one of the reasons China Mieville is so high on my to-read list. JS&MN will definitely be somewhere right at the top if I ever make a similar list. :D Thanks for the tip about the short stories - will definitely be buying!